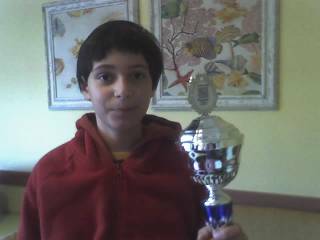 After several interviews with either professional Go players (Tei Meiko 9 dan), or strong amateur players (Cristian Pop, Seokbin Cho), this time I am presenting to you a youth champion: Theodor Toma became European Youth Champion under 12 earlier this year. Theodor will soon come to US for the World Youth Go Championship, in Boston, where he will again play in the under 12 category. You can read an interview with Theodor on the main website. Park Yeonghun won the final game by 1.5 points – so Lee Changho lost a big chance to comeback as a leader on the international scene. The game record is on the Fujitsu page. They said that July 7th 2007 (07-07-07) is a very lucky day (since number 7 is considered lucky). It was indeed a lucky day for the Korean Go, but not so for the Japanese Go: the semifinals of Fujitsu saw the 2 Korean players winning against the 2 Japanese players, so the final will be all Korean. Park Yeonghun defeated Yoda Norimoto by half a point, while Lee Changho defeated Cho U by resignation. Go the the tournament page for the Lee Changho – Cho U game, with Cyberoro variations. The final will be played on July 9th, in Japan. The July issue of the Sydney Go Journal just came out. You can read it at the regular journal page: 361points.com/sgj/. You are currently browsing the 361points.com/blog blog archives for July, 2007.